Device left on a table prior to 4-1 defeat. 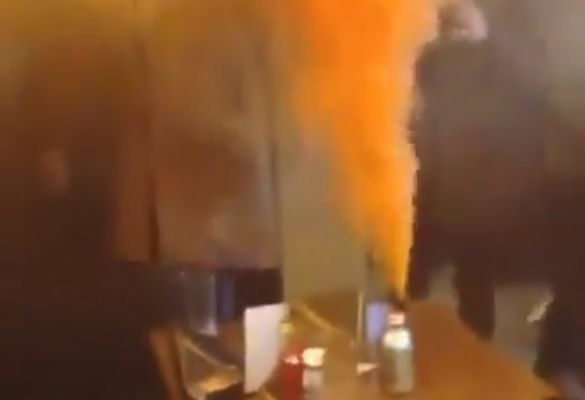 A bunch of rowdy Hull fans let off a smoke bomb inside a pub prior to their game at Sheffield United this afternoon. Setting the fire alarms ringing in the background, the travelling supporters fill the establishment with a thick orange smoke as one member of the group leaves the device on a table. The venue has been identified on social media as possibly being the Globe pub, near to a Sheffield Hallam University campus in the city and said to be popular with students. Songs can be heard until no one can see much of one another. Sheffield United went on to beat Hull 4-1 at Bramall Lane on Saturday.